Shining like a high-altitude sapphire, Crater Lake rises from the old growth forest that surrounds it like a guardian protecting its jewel. Oregon’s only National Park beckons visitors with its famous intensely blue waters and vertical walls that slope down to kiss their reflections in the stillness. The serenity of the lake belies its birth from the volcanic eruption of Mount Mazama, over seven thousand years ago, which collapsed inward forming the 5-mile wide caldera now home to a range of wildlife who thrive in the stark volcanic landscape. Scrambling about in rocky terrain, the squirrels and chipmunks most commonly seen can be found going about their business and trying to avoid the sly coyotes, and maybe even the occasional bear, on the prowl. Established in 1902, this off-the-beaten-path park boasts the deepest lake in the United States and covers 183,224 acres of diverse habitat. 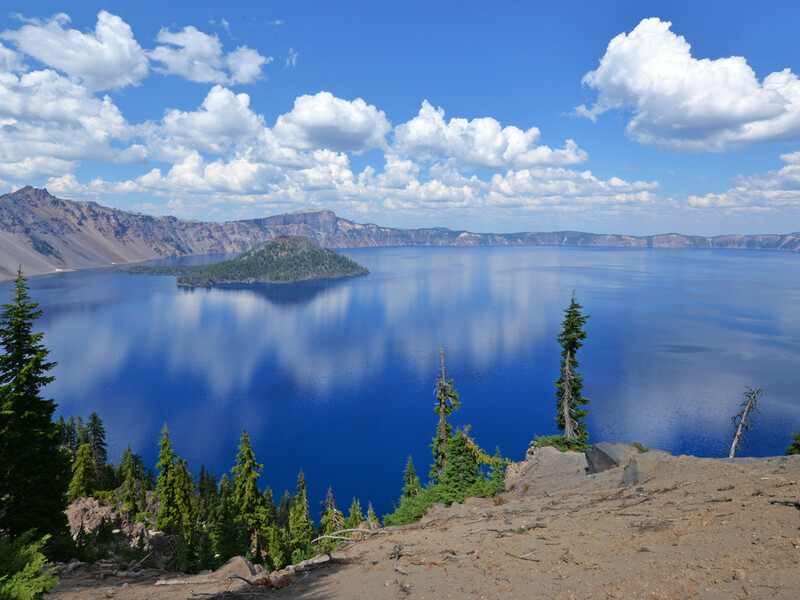 The rhythms of life are ruled by the weather at Crater Lake National Park, which is the fifth snowiest place in America with an average of 44 feet per year. Add in the remote southern Oregon location, and it's no surprise this unusual gem only hosts an average of less than half a million visitors per year. Explore the surrounding terrain on foot, horseback, snowmobile or cross-country skis for a true ‘get away from it all’ experience. The best known activity at CLNP is the rolling 33-mile Rim Drive around the caldera. For the most spectacular views of the azure waters, make way to the East Rim Drive and stop at the Phantom Ship Overlook, a rock formation rising out of the water which gets its name from its resemblance to a ghostly ship, especially in the often-present mist and spooky low-light conditions. 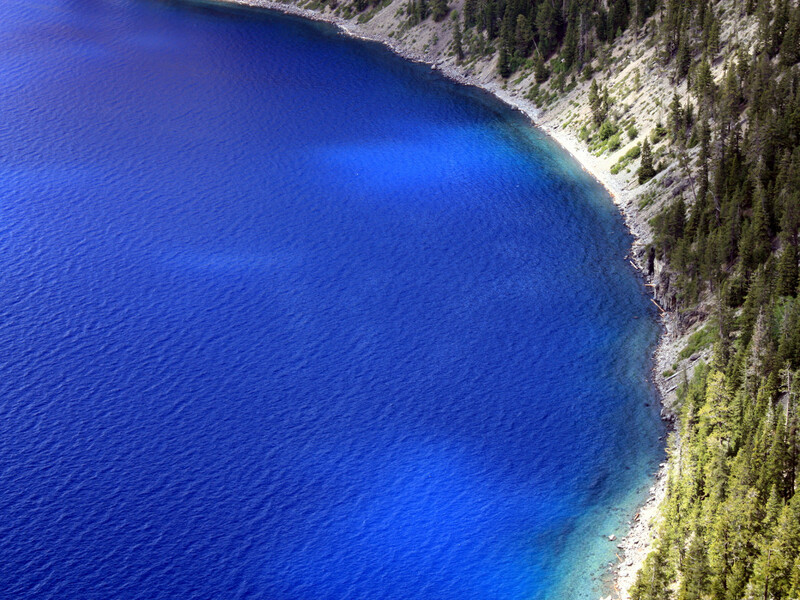 With about 100 miles of trails in Crater Lake National Park, opportunities to get a hike in are abundant. For peak baggers, Mount Scott is the highest and one of the most difficult peaks in the park at an elevation of 8,929 feet. In the short summer months, it’s a great option for wildflower hunters. The trail is 2.5 miles with the added bonus of the trailhead having one of the cleanest, nicest pit toilets in the area. It’s also a great place to stop for a picnic on the driving route. The most popular hike is Garfield Peak, a short (1.7 mile) but steep hike that starts near the Rim Village. A highlight of this hike is that you can see the Phantom Ship formation from above. If you’re short on time, there are several easier hikes that take 30-60 minutes and are a mile or under: Discovery Point Trail, Sun Notch Viewpoint, and the Pinnacles Valley Trail are popular choices. The pinnacles are towering needle-like formations of rock and are considered one of the highlights of the park if you only have time for one. If waterfalls are your thing, you’re in luck with several in the park, the most spectacular of which is Toketee Falls. 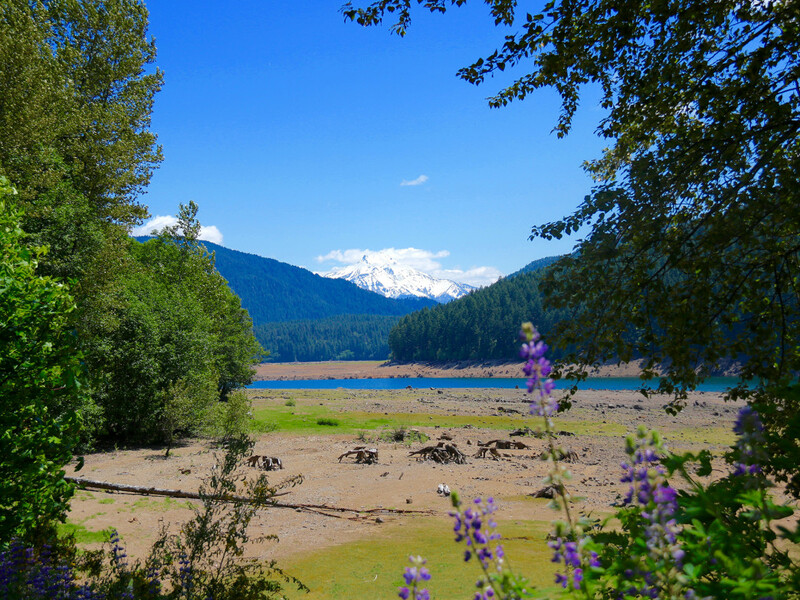 For adventurous souls, swimming is allowed along the shore at the base of the Cleetwood Trail. While only about a mile long, it’s a steep scramble down 700 feet to the glassy waters. With average summer water temps of 55-60 degrees you’ve got to really want it. The most daring can leap off of a 20-foot rock ledge that has become something of right of passage. While down there, drop a line beneath the stained glass surface and lure in the Rainbow Trout and Kokanee Salmon. Because fish aren’t native to the lake, fishing is not only allowed, it’s encouraged, with no license needed and no limits—just make sure you bring artificial bait. Another classic option is the boat tour out to Wizard Island where you can hike, take a picnic, or risk a bracing dip. Those who prefer things low-key can take a step back in time with a trip on the historic trolleys. Complete with a guide, the two-hour tour will hit the highlights of the Rim Drive and are designed to accommodate visitors that may have some disabilities. Often buried under snow for eight months out of the year, Crater Lake is a great spot for cross country skiing and snowshoeing. Circumnavigating the Rim Road is one of the classic backcountry ski treks in America. Watching the sunrise over the cobalt lake, the snow bathed in pink hues is worth braving the three-day trek, chilly temps and windy conditions—as long as you’re prepared for them that is. If a three-day epic isn’t your speed, you can check out the the most popular beginner trail, the 5-mile Wizard Island Overlook trail that has a view of the crater and travels gently rolling terrain. For the more experienced the 10-mile Sun Notch Trail is a good choice with a view of the Phantom Ship. Be warned that during avalanche season, you’ll need to use bypass routes on some trails. The Rim Road is always an option, pending wind conditions and visibility, which is often poor in the winter. If two-wheeled fun is more your speed, bicycle riding is starting to grow in popularity. While a cycle tour of Rim Drive is always an option, the park now organizes two vehicle-free weekends in September offering the opportunity for enthusiasts to hike and bike on 24 miles of car-free roads. 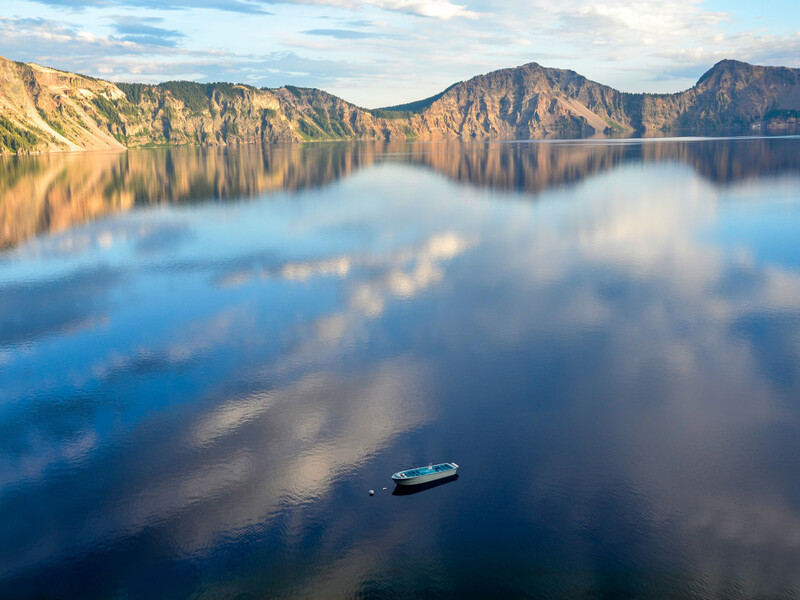 Due to its level of isolation, Crater Lake is a stunning place to see the night sky, possibly the best in America. Find a spot where car lights won’t flash in your eyes, bring a pair of binoculars, and be wowed by the Milky Way as you’ve never seen it before. Tips: bring a sweater, bug repellent, and time your trip for a new moon if you can. 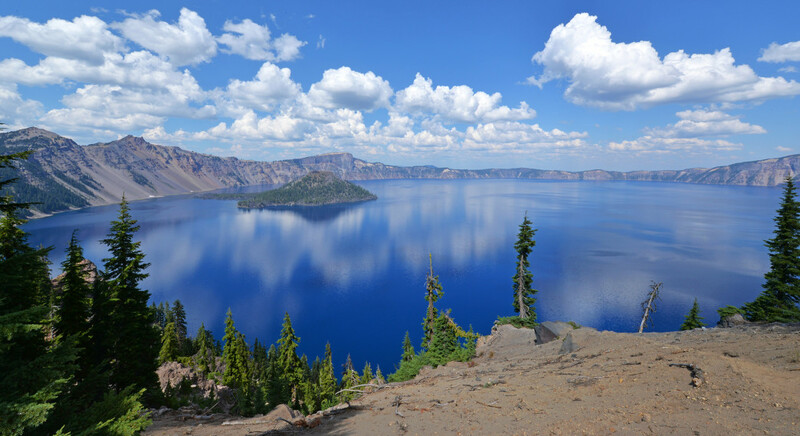 While most of the hikes at Crater Lake are easy day hikes, if you’d like to go farther backcountry, the Pacific Crest Trail, a 2,650-mile long-distance hiking and equestrian trail that stretches from the Mexican to Canadian borders, passes through the park and is easily accessible. If you don’t mind skipping the lake view, there are also a wide variety of trails in the park that allow horses and other stock animals. If you want to stay in the park during the limited summer season, book accommodations early as the number of rooms and campsites are limited. If you’re on a budget or prefer to camp, there are loads of free or inexpensive camping sites in the nearby Rogue River National Forest where you can get a lovely spot right on the water. Pets are welcome in the park in all the areas that are paved, including the look outs and campgrounds. There are also a handful of trails, sans lake view, that you can hike with your furry companions. Note that while opportunities for photography abound with killer sunrises and sunsets, drones are prohibited in the park. You will need warm gear at night at all times of year. The caldera is often foggy in any season and the weather in winter is extremely unpredictable, check the forecast regularly and be ready for all contingencies. While you’re in the area it would be a shame to miss the best pie in Oregon, maybe the entire Northwest, found at Beckie’s Cafe at the Union Creek Resort.